In order that the exchange and flow of information occurs smoothly, we’ve established a set of rules known as “Protonetiquette”. We ask all members of the support forums to adhere to these rules. Express your issue as clearly and precisely as possible, since this will enable you to receive a rapid response. Let other share in your experiences. * Protonet Support (which acts as moderator) reserves the right to remove double posts or unsuitable posts. Where can I find the support identifier and SOUL version? Since SOUL 2.24 (stable/64), essential information has been available to all registered users in the yellow boxes on the help page. To receive support, you must file a support ticket containing all available information on the incident or problem at support.protonet.info. You should also specify a support identifier or solution owner and the software versions of relevant programs and operating systems. We recommend that you give the names and contact information of any technical employees who are familiar with the problem/incident and the IT environment. In the first instance, users should clarify questions and problems with the owner of the solution. The Support Portal offers a search function for existing information and instructions and the user forum. We highly recommend making use of it, especially outside the support times. Protonet does not use a call centre and instead staffs all support positions with specialist personnel from the fields of programming, IT administration, system electronics and consulting. Protonet Support is known for its speed of service and often goes above and beyond what is strictly necessary. In case of emergencies (please refer to the definition given below), customers with the Gold service package can call the number shown on the contact form or, for an emergency at Priority Level 1 or 2, issue a callback request. The more detail you can give about the problem in writing when you first contact us, the better our support team can prepare for your consultation. This also helps us to plan an adequate amount of time for your consultation (particularly if it falls outside of regular support times) and thus to guarantee the best possible standard of support. If you have opted for the Silver or Bronze service package, a telephone consultation may be offered at the discretion of our support team. Protonet Support is not reachable via the general Protonet contact number; similarly, this number cannot be used to request callbacks or to request to be forwarded to other departments. Response times apply during the official support hours. The response time is defined as the period of time required for a support worker to return an initial response after receiving the support ticket. As such, the response times given in the overview above should be considered maximum times. The order in which tickets are dealt with depends on the service package and priority level of the ticket and the available support capacity. *The processing of Bronze tickets can be subject to cost and will be calculated based on the current hourly rate for support and the number of hours required. The support engineer dealing with the case will inform you of any costs at the beginning of the process. The reporting and analysis of software failures is exempt from the above. Classification of support requests according to priority level facilitates the optimal processing of support tickets according to complexity/urgency and ensures that all cases are given the necessary care and attention. Use of the Protonet solution is limited to a business-critical degree or is completely impossible. Use of the Protonet solution is generally possible, but is severely limited in certain areas. The Protonet solution is functional save for one particular issue. You have an inquiry, non-critical issue or non-critical software error pertaining to the Protonet solution. Where the nature of the problem allows, we recommend you begin by seeking an answer in the user forum. The forum enables Protonet uses to communicate at all hours of the day independently of the Protonet Support. The support team may adjust the priority level of a request in the event of misuse of the system. 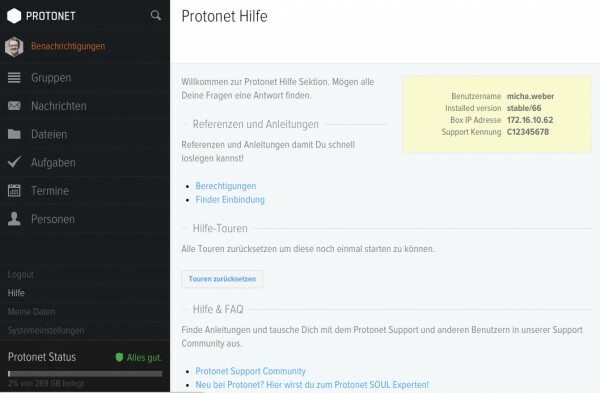 If direct access to the Protonet solution is required for analysis or repair purposes, a maintenance password will be created by the SOUL administrator (if not already known) and forwarded to the Protonet Support team. This is best done over the telephone. If a new password is generated upon completion of the work, it will no longer be possible to access the server using the old one. The new password should be noted for emergencies and stored in a safe place. For analysis reasons it might be necessary to remote connect to your computer. The Teamviewer 10-QuickSupport Client does not need any installation and can be downloaded below. The remote connect to your computer is protected by a personal ID and password. As soon the teamviewer session is over, Support cannot longer access your computer.